BIRDSTON HOSPITAL, MILTON OF CAMPSIE Birdston Hospital was originally designed in 1897 by Robert Bryden, as the Lennox Joint Infectious Diseases Hospital. 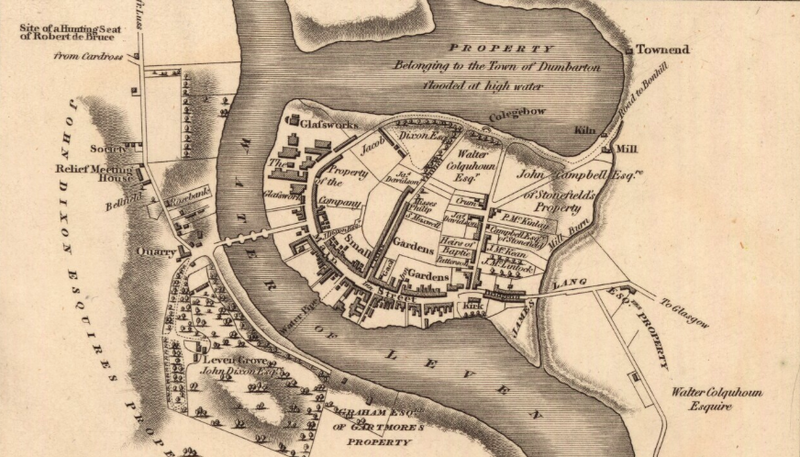 It served the Counties of Dumbarton and Stirling in combination with Kirkintilloch burgh. Plans for such a hospital had first been considered in the 1880s but it was not until 1895 that an agreement was reached to build a 24-bed hospital and a site acquired at Birdston from Mrs Peareth Lennox, then owner of Lennox Castle and Estate. In June 1897 Robert Bryden was chosen as architect after a competition. 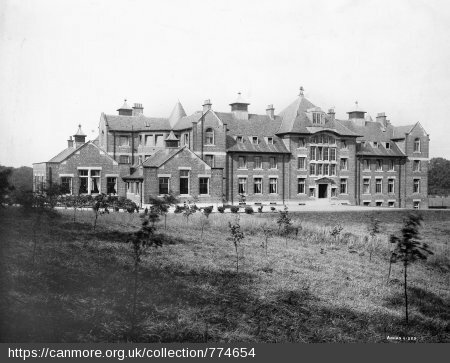 The hospital was built on the standard plan with a two-storey gabled administration block, (containing two observation wards), and two ward pavilions. The laundry block also incorporated the mortuary which had an annexe from which the deceased could be viewed without risk of infection. The pavilions were typically plain with modest decorative effect only indulged in for the administration building with its half-timbered gables. It is a decent example of the small-scale, functional infectious diseases hospitals erected at this period. In 1907 John Shanks designed a day-room and isolation ward, linked by a corridor to the scarlet fever pavilion and in 1913 the administration building was extended. In 1959, after the hospital had become part of the National Health Service, it was agreed to transfer the hospital to Kirkintilloch and Kilsyth Board of management and convert it into a geriatric unit. A new physiotherapy department was built in 1968 and link corridors between the two ward blocks and the visitors’ waiting area. 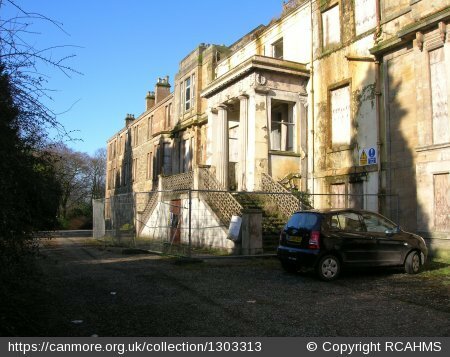 BROOMHILL & LANFINE HOSPITALS, KIRKINTILLOCH The original Broomhill Home was adapted from Broomhill House which had been built in two stages, comprising a central villa to which prominent end bays had been added in the manner of David Hamilton. The house was acquired as a hospital for incurables following the formation of the Scottish National Institution for the Relief of Incurables in 1874. Miss Beatrice Clugston was the driving force behind the foundation of the hospital which she originally intended to establish mid-way between Edinburgh and Glasgow, but, in July 1875, Broomhill House and 80 acres of ground were purchased. The home was inaugurated by Lord Shaftesbury on 6 October 1875 and was formally opened by Lord Provost Bain on 30 August 1876. It provided beds for 49 adults and 12 children. An extension to the east, designed by James Salmon & Son c.1886, comprised a three-storey block surmounted by a tower. The west wing was opened on 18 May 1895 by the Duchess of Montrose to provide improved accommodation for staff. In 1902 a legacy of £5,000 from Miss Martha Brown of Lanfine enabled the construction of a Cottage Home for Incurable Consumptives. Two years later, on 14 May, the Lanfine Home was opened with 18 beds. It was built to plans by James Salmon, drawn up to the instructions of Miss Brown back in 1879. An extension opened in 1910 increasing its capacity to 44 beds. A new staff hostel was provided in 1924. In 1948 the two homes transferred to the National Health Service and on 1 February 1960 Broomhill and Lanfine were formally amalgamated. In the following year the Lanfine Nurses’ Home was vacated to be converted for geriatric amenity beds. However, this work was delayed for over ten years. In 1972, a new occupational therapy unit was opened. Broomhill and Lanfine closed in 1995, this photograph was taken by Raymond Okonski in 2007 and shows Broomhill house in a sad state. 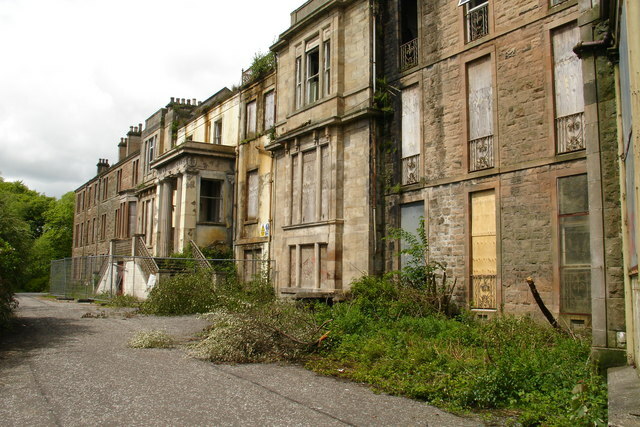 The hospital is on the register of Buildings at Risk in Scotland and in 2013 remained in ruinous condition. CAMIS ESKAN HOSPITAL, CRAIGENDORAN Camis Eskan House, a mid‑seventeenth century house with an addition of c.1840 by David Hamilton was refronted in 1915 by A. N. Paterson. 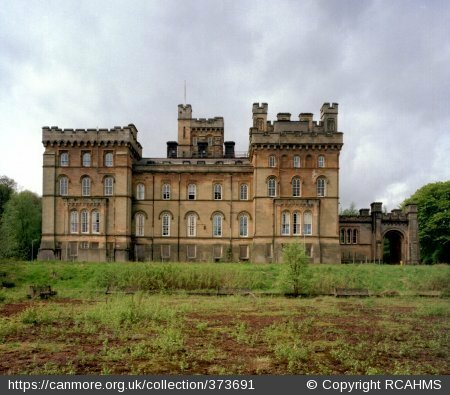 It was requisitioned during the Second World War by the Department of Health for Scotland and then occupied by Dumbarton County Council as an infectious diseases hospital. DUMBARTON COTTAGE HOSPITAL This small cottage hospital was designed by Shiells & Thomson in 1888-9 and opened c.1890. It is a good example of its type, without too many later alterations or extensions. It has a central emphasis with a taller centre block flanked by single storey ward wings. DUMBARTON JOINT HOSPITAL, CARDROSS ROAD, DUMBARTON This substantial hospital was built as the local authority infectious diseases hospital c.1898, J. M. Crawford was the architect. The site on rising ground outside the main town was chosen for the abundance of fresh air and necessary isolation. The stone administration block has most of the architectural embellishment and there is a small gate lodge in similar style at the site entrance. 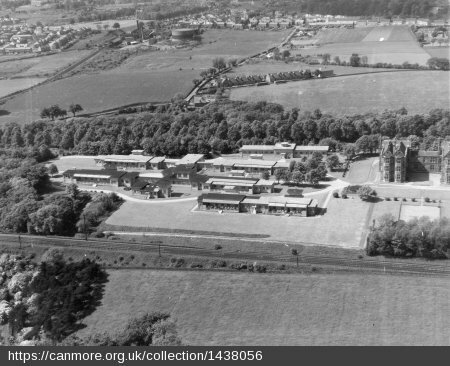 DUNTOCHER HOSPITAL (demolished) The hospital was formerly the Duntocher Joint Infectious Diseases Hospital established by Milnagavie Town Council and Dumbarton County Council. Designed by Robert Bryden it was markedly similar to his domestic scale, infectious diseases hospitals at Birdston and especially Blawarthill. Bryden died before Duntocher was completed. The hospital opened on 19 January 1907. Extract from the 2nd edition OS Map surveyed in 1914. Reproduced by permission of the National Library of Scotland. Extract from the 1:25,000 OS Map published in 1958. Reproduced by permission of the National Library of Scotland. After the inception of the National Health Service the hospital became a TB centre with a chest clinic opening in 1956. With the decline in the need for TB accommodation and as part of the restructuring of the hospital services for Clydebank, Duntocher was developed as an out‑patient and GP maternity unit with a new maternity block by J. Davidson & Son, of Coatbridge, begun in 1964 along the lines of maternity units at the Alexander Hospital, Coatbridge and Hairmyres, East Kilbride (see separate entries). The unit opened in January 1966 but closed in 1974 when the hospital was converted for GP medical beds and young chronic sick cases. Fairways View housing estate now stands on the site. LENNOX CASTLE HOSPITAL, LENNOXTOWN Lennox Castle, situated at the western edge of the hospital complex, was built between 1837 and 1841 to designs by David Hamilton. It was designed in a picturesque neo‑Norman style with castellated and battered walls, and an imposing porte‑cochere. There are some fine interiors on the principal floor but the building has suffered badly from subsidence. The external stonework is also in very poor condition near the ground and has been roughly patched up with concrete rendering. In April 1925 Glasgow Parish Council resolved to build a new Mental Deficiency Institution under the provisions of the 1913 Act. In 1927 Lennox Castle and its vast estate were purchased, and plans prepared for what was to be the largest and best equipped hospital of this type in Britain. It was to provide 1,200 beds at a cost of 1.25 million. Work began in 1929 to designs by Wylie, Shanks & Wylie. The hospital was finally completed in 1936. The site was divided into five sections; a male division, a female division, a hospital section, married staff houses and the engine house. The male and female sections each consisted of ten dormitory blocks for 60 patients. These were split into two main wards with 28 beds and two side rooms with two beds, together with a day‑room and sanitary annexe. Meals were to be provided in two central dining‑halls capable of seating 600 patients each. Above the dining‑hall, accommodation was provided for unmarried male attendants. Lennox Castle itself was adapted into a nurses’ home. There was also a central Assembly Hall for all the patients, it contained a large hall with a stage and equipment for cinema shows as well as some administrative offices. All the new blocks were built of brick and incorporated many innovative features, in particular the heating system which operated on a system of underground tunnels. There is a considerable variety of plan and composition which add interest to the site. It is a scheme of high quality and the Assembly Hall and dining‑halls in particular deserve attention. Both make use of arched windows on the ground floor and each has a central bold entrance bay. On the Assembly hall this comprises a grand arch rising the full‑height of the building and framing the porch, and on the dining‑hall blocks the door is set into an arch, which in turn is in a tall gabled centrepiece. The varied roof-line also adds interest. The low pitch behind the parapet caps the two‑storey Assembly Hall block, while the steeply pitched roof, with first‑floor dormers, dominates the dining‑halls. A charming octagonal tea‑room in two tiers with plenty of windows, echoes the tea pavilion at Glen‑o‑Dee Hospital. LENZIE HOSPITAL Lenzie Hospital was formerly the Glasgow Convalescent Home for the Glasgow Royal Infirmary. Such a home for the Infirmary was first established at the instance of Beatrice Clugston in 1866 in a rented house at Bothwell. 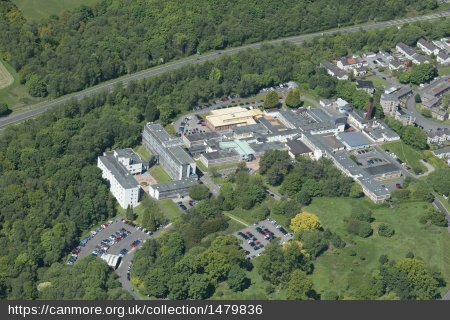 In 1870, having found the experiment successful, the Directors acquired the Lenzie site and commissioned James Thomson to design a plain substantial building capable of holding 62 patients. The foundation stone was laid on 28 August 1871 by the Earl of Shaftesbury. The resulting building resembled an expanded villa with an Italianate tower. VALE OF LEVEN HOSPITAL, ALEXANDRIA This was the first new hospital to be completed in Britain under the National Health Service at a cost of around £1 million. WAVERLEY PARK HOSPITAL, KIRKINTILLOCH Waverley Park Hospital was established by the Glasgow Association for the Care of Defective and Feeble Minded Children. The Association was founded in response to the Royal Commission on the Feeble Minded and the hospital opened in 1906. It was situated in a converted mansion house of three bays and two storeys to which five‑bay wings were added designed by John Shanks. Further additions were made to the rear in the 1930s. WOODILEE HOSPITAL, LENZIE (demolished) Woodilee Hospital was originally built as the Barony Parochial Asylum to designs by James Salmon & Son in 1871‑5. Serving the same purpose as a District Asylum but administered by the parish authority, it represents the final development of the lunatic wards provided in the poorhouse. This was the first pauper asylum built by a Parochial Board on such a large scale and completely removed from the poorhouse. Extract from the 2nd edition OS Map revised in 1896. Reproduced by permission of the National Library of Scotland. The oldest section of the hospital was under threat of demolition in 1990. Indeed, much of it has already been demolished following two serious fires. This resulted in the loss of the fine recreation hall. It was a major landmark on the Glasgow to Edinburgh railway line. Its central feature being the twin towers above the recreation hall, and the simple gothic chapel with a steep pitched roof and delicate French gothic spire to the south. Much of the detail of the centre buildings and the ward blocks is Jacobean with shaped gables, diminutive onion domes and mullioned and transomed windows. The two towers rose in bold square section and were capped by balustrades enclosing a very elongated domed cupola. The scale was very impressive, particularly of the vast recreation hall. 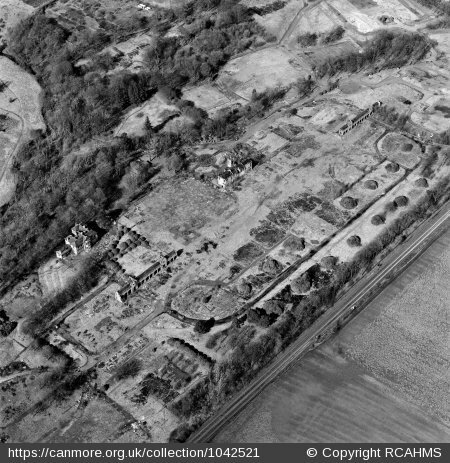 Aerial photograph of the site of Woodilee Hospital taken by RCAHMS in 2001. Most of the main building had been demolished, but two stretches of the link corridor remained and the chapel. 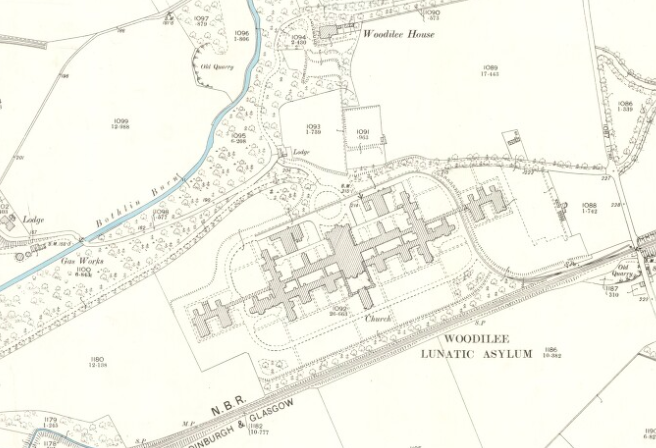 Woodilee was one of the asylums described by Sir John Sibbald, Commissioner in Lunacy, in his paper of 1897 ‘On the plans of Modern Asylums for the Insane Poor’. He chose Woodilee to illustrate the type of plan evolved by the 1870s which marked a departure from the previous Gartnavel model. Here the patients’ accommodation was broken up into smaller units and the classification of the patients carried through into the architecture more thoroughly than before. In this way the wings for hospital and observation wards were quite distinctive from the ordinary patients accommodation and day‑rooms were all placed on the ground floor reserving the upper floor for sleeping quarters. The day‑rooms themselves were much more comfortably arranged, resembling drawing rooms instead of the long galleries of Gartnavel. They also looked onto the gardens and made access out of doors easier. Walled airing courts were also done away with. In 1898 enlargements were carried out after the City and Barony Parishes of Glasgow were amalgamated. Other extensions and additions included the farm buildings and a nurses’ home which was later extended in 1939. A villa for children was added in 1900 and in 1939 a new reception house and sanatorium, operating theatre, dental surgery and laboratory were constructed. This page was fascinating. Though the old listed Duntocher Hospital was mysteriously burnt down in the 1990s, you can still see the hospital’s original gate pillars at the hospital’s former entrance and the Edwardian hospital wall with its, elegant scroll designed, iron railings on top of it. You can also see the surviving red sand stone lodge gate house at the hospital’s former entrance. No mention of Stobhill hospital! !